Someone recently told us how they like to keep busy, and that they weren’t content to sit and watch the world go by. Chris and I both piped up that we like to sit and watch the world! I’m not lazy but I love to slow down and watch what is happening here on the farm – or in nature anyway – and for that matter people watching is mighty entertaining as well. Being aware of our surroundings can give great joy. 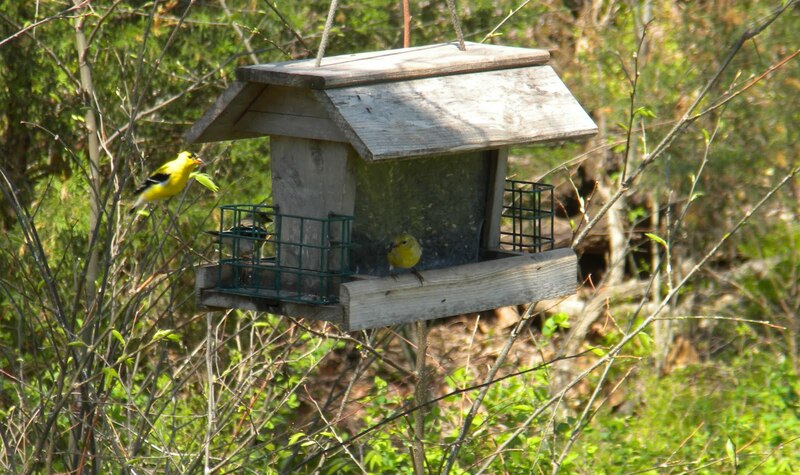 The past few days I’ve been dazzled by these little yellow birds on the feeders. I think we’ve got both warblers and finches munching away on black oil sunflower seeds. It’s hard to catch them in the act with my little Coolpix camera though. As soon as I get close enough to really zoom in they fly off to the trees. I snapped this photo (the best I could get) while walking back from the studio yesterday. This morning there were several dozen in the trees and on the ground surrounding this feeder. Aren’t they dazzling? Especially that one just left of the feeder! Color is abundant in the new yarns I just added to the Alpaca and Llama online shop as well. 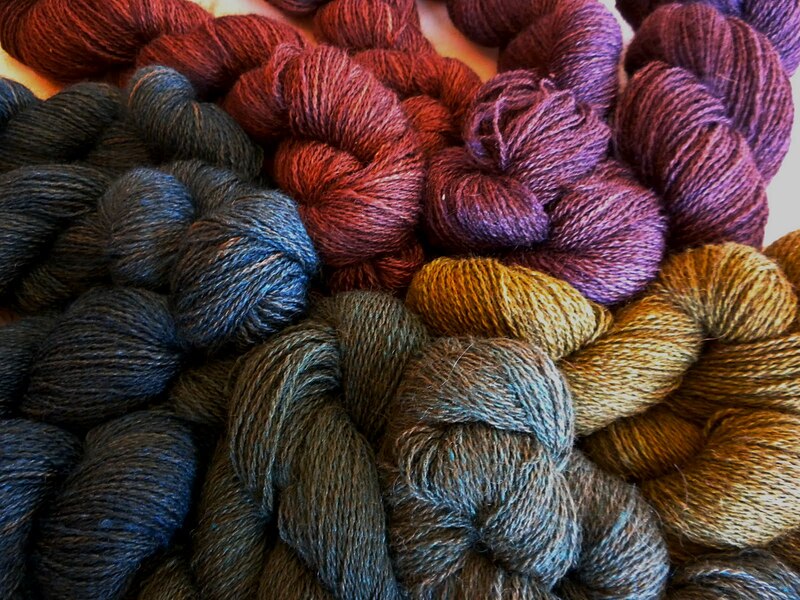 Most of the week has been spent dyeing the Alpaca Tussah Silk in lace weight, and the Llama Bamboo in sport weight. The base yarns for both of these weights are a sweet faun color and they take the dye beautifully. When I dye commercial yarns like our Oak Barn Merino or the Lost City Silk, I’m starting with a fairly blank slate of white or ivory, but with the local fibers it’s rarely pure white or ivory. A dye bath used on ivory yarn can have quite a different result when you toss in a faun or gray yarn. It’s always interesting. The faun color is wonderful in it’s own right and so I decided on several of the colorways I’d let a little faun show through. Take for instance the Winter Hike in both Llama Sport and Alpaca Lace, you’ll see little glimpses of the natural color of the fiber in the yarn. Makes sense to me that on a yarn called Winter Hike there should be some tan or brown involved, how about you? The same thing with the new Extra Virgin and Indigo Bunting. I played with the amount of dye used in the pots and the yarn placements so the skeins show just a hint of faun. I hope you’ll like them as well as I do. Last Saturday was the Opening Day at Cherry Street Farmers Market and it was a busy one! This Saturday we’ll be at the Sand Springs Herbal Affair. The Herbal Affair is the big mama of herb festivals in Oklahoma. Held in the historic downtown district, numerous streets are blocked with barricades for vendors to set up offering plants, soaps and sundries, flowers, art and crafts – oh the Amish ladies will be there with dumplings and pies for sale. The town square in front of the old Carnegie library is transformed to a stage where folk, bluegrass and Celtic music will be played for attendees who’ve taken a break from shopping to sit on straw bales. If you’re in Oklahoma this Saturday – come out to the Herbal Affair. You don’t want to miss it! In the 21 years that this festival has been going on I’ve missed one, and I’m not about to let that happen again!